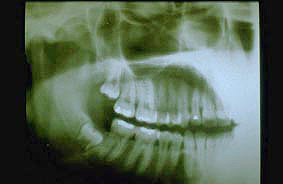 This 18 year old female was noted to have a radiolucent lesion involving the right mandible. 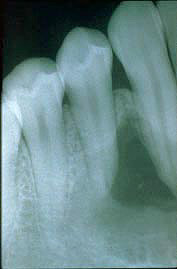 It appeared well-delineated, was asymptomatic, and the associated teeth were vital. A large differential diagnosis could be elicited in this case because of its uniform cystic appearance. Slide 1 (medium power, H&E). 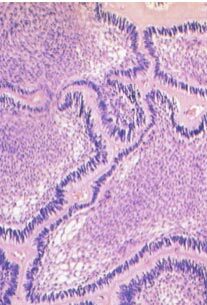 The center of this field shows collections of multinucleated giant cells. 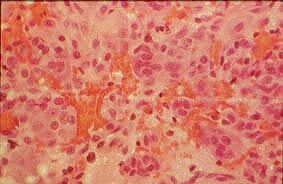 (The haphazard arrangement of the nuclei indicate that they are osteoclastic or foreign body type giant cells.) A significant amount of hemorrhage is seen, some of it is related to the surgery while the rest is an inherent part of the lesion. The supporting stroma is cellular and fibroblastic. Note the osteoid which is being formed in the upper right portion of this slide. Slide 2 (high power, H&E). 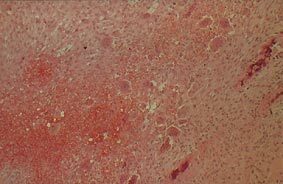 This slide demonstrates a closely knit focus of giant cells and areas of hemorrhage.